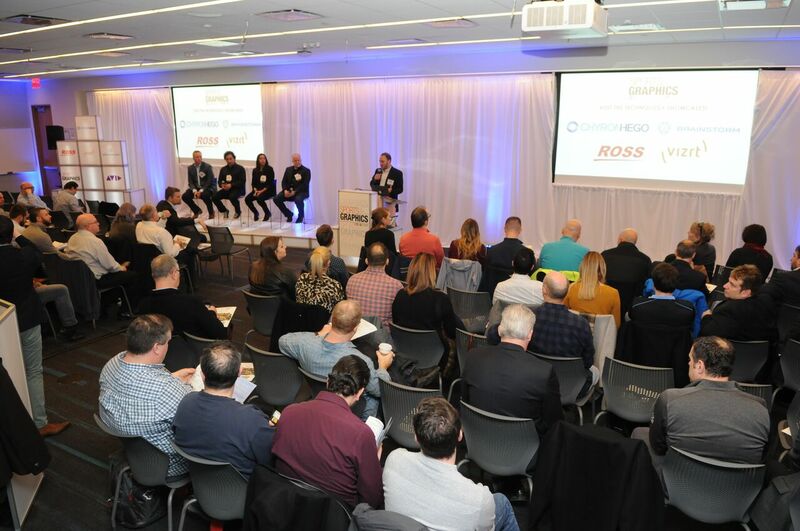 A record crowd of more than 175 sports-graphics production and technology professionals turned out for SVG’s third-annual Sports Graphics Forum at the Microsoft Technology Center in New York City on Wednesday. Headlined by ESPN’s keynote presentation going behind the scenes of Monday Night Football’s new open for the 2016 season, the Sports Graphics Forum also included a full day of sessions and networking. This year’s Forum was once again chaired by Big Studios owner/Director Jocelyne Meinert and spearheaded by the SVG Sports Graphics Advisory Committee. For the first time, the SVG Sports Graphics Forum — which was made possible by Title Sponsor ChyronHego and Event Sponsors Avid, Brainstorm, Ross Video, and Vizrt — featured a pair of sessions focused on Creation and Technology, respectively. 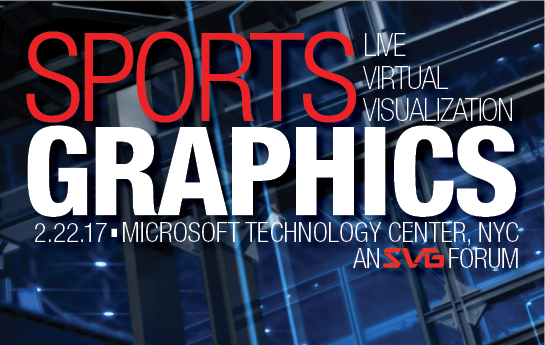 3:30 – 4:00 p.m.: The Evolving Landscape: What’s Ahead for Sports Graphics in 2017? 2:45 – 3:30 p.m.: Inside the Truck & Control Room: What’s New in Real‐Time Broadcast Graphics? The third‐annual Sports Graphics Forum kicks off with a top‐tier discussion featuring creative directors and top graphics production pros. What are the significant creative and technological trends? What are the industry’s greatest challenges and opportunities, and what lies ahead for the sports‐graphics sector? How do we get our creative lightning to strike: formal meetings & assignments? Loose and ad hoc discussion? Listen to ESPN’s surprising and inventive journey to the 2016 launch of the Monday Night Football Open. In‐venue videoboard productions have become full‐scale broadcasts in recent years, as fans demand the time and score, the latest stats on their favorite players and fantasy teams, and much more. Venue‐production leaders and tech vendors discuss the challenge of scaling graphics across a variety of screens, the need for automation, and how to balance entertaining and informing the fans. Super Bowl LI took VR to the next level as Fox Sports and LiveLike production teams came together to deliver a six-camera VOD VR experience that took users up close to some of the most important plays in the game. Avid also played a major part in the efforts and this presentation by LiveLike, in association with Avid, will focus on the virtual reality set up at Super Bowl LI. A little over a year ago, MLB Network hired Mike Gallardo a former Cav Scout who served in Iraq with the 1st Cavalry Division. To say Mike is a warrior is an understatement. Hear his story and the impact he has made in his new career. Designing graphics for mobile devices and streaming experiences has presented a host of new challenges for creators of live sports content. Designers need to understand the complexities of working with mobile platforms and how they vary from graphics production for linear television. Digital sports execs and vendors lay out best practices in graphics creation for streaming and mobile experiences. This can’t‐miss session will examine the best of graphics innovation in 2016. Our panelists will present their picks for the most notable work from across the global broadcast landscape. A deeper dive into future directions, opportunities, and challenges: How does the graphics industry’s rapidly changing landscape affect creative teams, budgets, and decision‐making? Hear industry leaders’ views and their predictions for 2017 and beyond. 360 VR sports content is happening. How will motion graphics develop and thrive in this new viewing environment? Learn from the graphics pros working in the trenches of this bleeding-edge new industry. Graphics have never played a more integral role in the production of live sports telecasts. How can producers identify new technologies that warrant investment, and how does the impending rise of 4K and HDR affect graphics operations? Top network and tech‐vendor execs discuss the latest issues and opportunities facing the industry today. Player‐tracking systems are all the rage right now, as pro sports leagues look to gather more data from the action on the field and broadcasters look to visualize that data for fans within their telecasts and live streams. Learn how these systems are evolving and how these technologies are changing the way fans view the game. From the 1st & Ten Line to virtual ad insertion, virtual graphics have been commonplace on sports telecasts for several years. Today, virtual graphics are a more integral part of live-sports coverage than ever, as augmented reality (AR) systems allow broadcasters to analyze the game like never before – both in the field and in the studio. Get an update on the latest developments in virtual-graphics, AR, and virtual-studio technology. Charlie Collin has been with ESPN since 2008. He is a senior manager in the Motion Graphics and Production Enhancements Department, specializing in real-time graphics technology. Collin has helped launch several exciting projects for studio and event executions. Utilizing touchscreen, augmented reality, virtual studio, and insert graphics, Collin is committed to visualizing data and information that facilitate the best story telling experience possible for ESPN fans. Jason Dachman oversees all aspects of SVG’s North American editorial operations, including the thrice-weekly SVG Insider newsletter and SVG’s annual print publications. A member of the SVG team since 2009, Dachman also serves as program director for SVG’s Sports Asset Management & Storage (SAMS) Forum, Sports Graphics Forum, and TranSPORT event. Prior to joining SVG, he spent three years covering local sports for The Patriot Ledger in Quincy, MA, and spent two years on the production staff of SiriusXM Satellite Radio’s The Ron & Fez Show. Dachman began his career in the Sports Information Department at Northeastern University in Boston, where he also earned a BA in media communications and cinema studies. A native of Denver, Colorado, Dachman currently resides in Brooklyn, New York. Terry Daily joined Ross Video in 2015 as an augmented reality and virtual set design specialist within Rocket Surgery, the creative services arm of Ross. Daily leads the technical and creative efforts for the managed service deployment of live augmented reality graphics for NBC Sports’ Sunday Night Football and Thursday Night Football. A seasoned 3D/2D designer, Daily works with a wide range of clients throughout the year to help fully leverage the capability of their Ross Xpression systems for traditional CG usage, as well as AR/VS application. New this season, Daily has led the way in the development of a customized interface for control and positioning of AR graphics for live sports broadcast production. Prior to his time at Ross, Daily held various roles in mobile/live and post-production – managing graphics and post-production at Earl Miller Productions, and working with clients like The University of Texas, LHN, ESPN, and CBS Sports. He also previously worked on award-winning teams in stadium entertainment, producing and executing cutting-edge in-arena motion graphics and video content at Baylor University and the Houston Astros. Matt Davidowitz joined STATS in June 2015 to oversee the strategy and roadmap for all of STATS’ broadcast products and services. Over the past year, Davidowitz has played an integral role in helping STATS provide more value to broadcasters through new research reports and data/graphics integration packages, including a MLB pitch type and velocity feed currently being utilized by NBC Sports Regional Networks. Prior to joining STATS, Davidowitz served as a graphics producer for seven years with CBS Sports and Turner Sports, covering the NFL, NBA, MLB, and NCAA Men’s Basketball Tournament. He won an Emmy Award in 2014 for his work on Inside the NBA. Ken DeGennaro serves as the senior vice president of digital product development for the National Basketball Association. He oversees a team responsible for all aspects of software development for the NBA, WNBA, and NBA Development League including online, data services, and OTT software. DeGennaro was instrumental in the successful launch of NBA.com/Stats, the official NBA statistical destination powered by the SAP HANA real-time platform in February 2013. The multi-award-winning site provides the league, teams, media, and fans with access to the NBA’s entire official history of statistics – more than 4.5 quadrillion combinations of statistics – including every box score in history. DeGennaro joined the NBA in May 1998 and holds a Bachelor of Science degree from Rutgers University and a Master of Science degree in Jurisprudence from Seton Hall Law. Jed Drake, a 15-time Emmy Award winner, serves as SMT’s executive VP of emerging technologies, overseeing the development and implementation of SMT’s comprehensive and integrated sports information and player tracking systems. For three decades, Drake has served as ESPN’s executive producer for some of the world’s most prestigious sports events, most notably the 2014 World Cup from Brazil, the 2010 World Cup from South Africa, NASCAR, Monday Night Football, Wimbledon, Roland Garros, The Open Championship, X Games and Winter X-Games, MLB, and the NBA. Under Drake’s leadership, exposure to FIFA through ESPN’s broadcast of six straight World Cups from 1994 through 2014 soared, delivering an immersive experience to soccer fans across the globe. Drake’s innovative approach to technology has resulted in the development of systems such as the Virtual Yellow 1st and Ten line used in American football, ESPN’s Virtual 3 three-point line used in NBA and college basketball broadcasts, the K Zone strike zone and baseball tracking, the ESPN Pylon Cam for Monday Night Football, and live player tracker systems used throughout the 2014 season of Monday Night Football, the 2014 MLS Cup, and the 2015 College Football Player National Championship. Jon Fish is an Emmy winning, and multiple other awards winning producer for ESPN. Fish has worked in all capacities as a storyteller for the network. His productions range from features to podcasts and documentaries all over the world. As a producer for ESPN in the storytelling unit, the role is always growing and changing. Most recently, Fish completed the SC Featured: Pin Kings project. Pin Kings featured ESPN’s first ever 18-part episodic podcast (Fish served as a co-host), and a 1 hour documentary, as well as an ESPN The Magazine article and ESPN.com roll out. Whether it is conducting interviews, hosting an episodic podcast, or producing hour long documentaries, each story allows for different tellings. In the fall of 2016, a new approach was taken while producing the Michigan vs. Ohio State college football game. Fish produced two stories for ESPNVR (ESPN Virtual Reality). Storytelling in virtual reality allowed the viewer to experience this timeless rivalry in a unique fashion. Fish has worked in television at all levels, from small and large markets to cable television, and ESPN for the past 19 plus years. A native of Boston, MA and a graduate of the University of Michigan, Fish lives with his wife and son in southern Connecticut. Michael Gallardo is a below-the-knee amputee. He had signed up for the U.S. Army because he felt that it was his calling and wanted to serve his country. In 2006, he was deployed to Iraq, where he encountered many gunfights, deaths, and improvised explosive devices (IEDs). On February, 7, 2006, he was assigned to clear the deadliest route in Iraq; it was known to have been the site of many deaths of U.S. soldiers. As Gallardo crossed a bridge on that highway, an IED blew up in his face, driving shrapnel into his eyes. Still, he kept moving forward. A second IED was on the side of road, where a patrol had dismounted. The team in the truck made a collective decision to run over the IED to protect a foot-mounted patrol; if the IED had been set off by the foot-mounted patrol, there could have been many casualties. Exploding the IED caused the engine to fly out of the hood and strike Gallardo, who lost consciousness for a couple of minutes. After regaining consciousness, he realized that one of his team members was still in the truck and tried to pry open the doors. Without realizing it, he placed his foot on the melted door to try to gain extra force to open the door, breaking and burning his foot and Achilles tendon. Even though his foot was not intact, he felt worse because he could not open the door. After losing consciousness again, Gallardo woke up at the hospital, where he was told that his foot was going to be amputated and that he would never be the same, that he would probably be able to walk and that was it. After healing from his injuries and receiving his prosthetic, he decided to do more with his life, to motivate, and inspire people, so he did the world’s toughest triathlon: The Silverman, an Ironman event in Henderson, NV. He showed people that, even though there are an obstacle in the way, there is always a way to go around it. After the Ironman, Gallardo joined CrossFit, Olympic weightlifting, wheelchair basketball, and many more sports. Thierry Gonzalo has been the product manager at Brainstorm since 2010, with an overall responsibility of the whole company’s portfolio regarding product definition and development supervision. Previously, he headed a development team designing bespoke solutions for weather, maps, and journalist applications, and managed a system integration team for manufacturers such as Grass Valley, Chyron, Sony, and Brainstorm. Earlier stages of his career include operation and hands-on experience as a CCU/lighting operator, CG, NLE and for over 10 years as a Vision mixer in both production studios and large OB vans for several national and regional broadcasters in Spain. With a global vision of advanced broadcast technologies, Gonzalo is an experienced lecturer and demonstrator with an unmatched passion for technology. Jason Joly is the director of broadcast graphics for MSG Networks. He and his team are responsible for the creative direction for MSG Networks’ live event packages for the Knicks, Rangers, Devils, Islanders, Sabres, Red Bulls, and Liberty. They also oversee the packaging for all on-air promotion, studio shows, and original programming. Joly is a seven-time Emmy Award winner with 15 years experience in sports television and design. Joly previously served as a producer at boutique creative agency Nth Degree, working for clients such as ABC, Bravo, CBS, Discovery, Food Network, HGTV, History, and Yahoo. A graduate of Syracuse University, he currently resides in New Jersey with his wife and two children. Joining the SVG team in 2011, Karen Hogan Ketchum focuses on the venue industry while also reporting on a variety of sports-production and technology topics as senior editor. She oversees SVG’s print publications and drives the company’s Venue Initiative, coordinating the program for the Sports Venue Production Summit and Venue Production Seminars and serving as editor for SVG’s annual Venue Production Journal. In addition, Hogan Ketchum is the director of the Women’s Sports Media Initiative. Hogan Ketchum began her career in sports at Fordham University with WFUV Sports, serving as supervising producer of “One on One,” WFUV Sports’ weekly call-in show. After graduating in 2009, Hogan Ketchum spent the 2009-10 season in the public relations department of the Trenton Devils (ECHL) before taking on a freelance copy editor assignment with Professional Sports Publications. A New Jersey native, she currently resides in Brooklyn, NY. Jaimee Kosanke is a vice president and co-executive producer of sports and documentary programming at Spike TV. In 2016, she produced approximately 70 hours of live combat sports television including Bellator MMA, Premier Boxing Champions, and Bellator Kickboxing, along with several long form sports specials. Kosanke is an executive producer alongside Network Entertainment on the documentary series I Am, most recently lauded for I Am Chris Farley and I Am JFK Jr. Kosanke started at Viacom in 2001 at MTV and moved to Spike TV during its inaugural year nearly 14 years ago. Andrew Lalonde oversees the progression, integration, and execution of the IPTV, in-house scoreboard broadcast room, and the unique “spectacular digital displays” in the newly opened Rogers Place and surrounding Ice District in Edmonton, Alberta. Lalonde was critical in planning the content playback machines within the VPCR and currently leads OEG content creators and operators in leveraging complex and synchronized elements that are controlled from single trigger points, while maintaining flexibility to adapt to the fast paced live sporting environments and deliver a show with high production values. Being a motion graphics animator, editor, and scoreboard room CG operator for several professional and junior sporting teams for the last 10 years, Lalonde knows the importance of an integrated, flexible, and high production scoreboard show to help accentuate the experience for all fans. David Leopold is a creative workflow specialist and the director of content and post production at Viacom Music and Entertainment. Having worked in nearly every aspect of production and post-production, Leopold spent much of his career as an editor creating content of all types, including broadcast series and specials, short form digital videos, ads, promos, digital campaigns, interactive, VR, and a feature-length documentary. Currently, Leopold applies his first-hand experience as an editor, motion graphics animator, producer, and post-production supervisor to identify and solve user-facing issues across Viacom’s brands. He leverages current tools and emerging technologies to develop solutions and workflows that streamline the creative process in an ever-changing digital creation environment. JP LoMonaco oversees the entirety of on-air design and graphics production for CBS Sports and CBS Sports Network as the senior art director. He began his tenure in the sports division in August of 2015, when he came on board to undertake the once in a lifetime project of re-branding CBS Sports from the logo up, culminating in the gold standard of all sports broadcasts, Super Bowl 50. LoMonaco is a four-time Emmy Award winner for outstanding art direction and design. He has been leading graphics teams in the broadcast industry since 1996 for networks such as FOX and UPN. LoMonaco is always re-inventing and pushing his personal design sensibilities forward and looks to motivate by example. He achieves this by being hands-on in his process and by raising the bar aesthetically to achieve his ever-evolving goals. A graduate of Parsons School of Design in New York City, LoMonaco resides with his wife and four children in Nutley, NJ. Fabrice Lorenceau studied cinema, television, and new media at USC and earned a student Emmy Award for his thesis film. He has worked at major production companies in the USA and France such as Cruise Wagner Production at Paramount (Mission Impossible 2, Minority Report) and Les Films Christian Fechner. With the emergence of the Internet, Lorenceau started YouFoot to empower everyone to create content for football. YouFoot specializes in big data, artificial intelligence, and user engagement (especially on social and mobile). In late 2014, with his brother André Lorenceau, he launched LiveLike which uses virtual reality to bring you and your friends together in a sports viewing experience that’s as easy as turning on your TV, as thrilling as going to the stadium, and as interactive as a second screen. Chris Mallory is an executive creative director and producer of grand-scale production design concepts and broadcast packaging. He is honored to date with 30 Sports Emmy Award nominations and 14 wins for high visibility events including the launch of Major League Baseball Network, Super Bowl XXXIV, XXXVII, and XL, Monday Night Football, and more. Prior to joining ABC Sports, Mallory was the art director for ABC News where he was responsible for the production design of Good Morning America, 20/20, World News Tonight, and special events, including ABC’s Presidential Election coverage. He is highly proficient at managing multiple teams, tight deadlines, and high demand clients and projects simultaneously. Mallory is creatively focused to ever-improve brand awareness and drive value for consumer audiences, advertisers, and employers. One of five direct reports of MLBN’s president, Mallory leads the Creative Services division of Major League Baseball Network. He oversees 22 staff members and is responsible for conceiving, maintaining, and perpetually enhancing the brand’s visual product to drive MLBN sales opportunities and audience engagement. The fourth original hire in the Network’s formation process, Mallory was recruited to design the “look” and visual touch points of the Major League Baseball Network brand, and to ready all visual elements for the Network’s 2009 global broadcast launch to over 61 million households, the largest network launch in cable TV history. In its debut year, this brand benchmarking earned one Emmy Award for Outstanding Production Design/Art Direction and another for Outstanding Graphic Design. The Network has continued to be honored with some of the industry’s most coveted awards each year since, with 67 Emmy nominations and 21 wins to date. Ever-driven to build new viewership and advertising relationships for the Network every day, the Creative Services team produces compelling, sophisticated, and innovative sales elements, long and short term production design packages, and all daily set content requirements for its three studios, as well as for Fox Sports, Turner Broadcasting, and other networks with which MLBN collaborates. Camille Maratchi is a producer and associate creative director at HBO Sports where she oversees the on-air graphic look for the department’s live telecasts, studio shows, and documentaries. While in this role, Maratchi has helped create the on-air look for HBO Sports’ flagship telecasts – World Championship Boxing, HBO Pay-Per-View, and Boxing After Dark. In addition, she was instrumental in the rebrand of two of its other properties, Real Sports with Bryant Gumbel and The Fight Game with Jim Lampley, which included a seamless integration of new set designs and complimentary insert graphic packages. Brian Matthews graduated from Syracuse University in 1995 and began his career with CNBC in 1995 as a graphic designer. In 1997, he joined the launch team for FOX News Channel and ultimately served as an art director. In 2002, Matthews joined ABC Sports as an art director, working on major events that included College Football on ABC, Monday Night Football, Super Bowl XXXVII, and Super Bowl XL. In 2007, Matthews joined NBC Sports as the director of promotion, working on major events that included the Summer and Winter Olympic Games, PGA Tour, NHL, The Ryder Cup, U.S. Open Golf, Triple Crown Horse Racing, Notre Dame Football, Wimbledon, Sunday Night Football, and Super Bowls XLIII, XLVI and XLIX. Matthews is a six-time Sports Emmy Award winner. Seven-time Emmy Award winner and 20-time nominee, Jocelyne Meinert has been pioneering CG animation and design since the industry’s inception in 1982, receiving several national and international awards in the first five years of her career. Meinert started Bigstudios in 1991, completing large scale design and animation projects for clients such as ABC News and Sports, HBO, MTV, Oprah, CTV, CBC, ESPN, CBS, and NBC. Bigstudios is now one of the most established design and animation studios in North America. Whether 2D or 3D animation, VFX, live action, graphic design, or all the above, Meinert continues to direct and manage the design and implementation of large-scale projects such as ESPN’s Monday Night Football, Turner Major League Baseball, and CBS March Madness, as well as original content development. Karen Nicol is an award-winning creative director with 15+ years experience in successfully creating design strategies that help drive the user experience and user interface for digital products. For the past four years, in the role of creative director of digital products, Nicol has been responsible for overseeing the design strategy of the entire line of web and digital products for NBC Sports, Telemundo Deportes, NBCOlympics.com and Rotoworld. Nicol has a background in 3D animation and video, but found her way into interactive design in the mid-nineties. She has experience in agency, as well as in-house production and management within many industries, including sports, entertainment, news, healthcare, telecommunication, and software development industries. Nicol’s passion is to develop new and innovative ideas and strategies for digital products and multimedia services. Nicol is married with two daughters: a junior at the University of Arizona and a high school sophomore. Timothy O’Shaughnessy is an art director at ESPN who has crafted the creative behind many ESPN properties, most recently the College Football Playoff. O’Shaughnessy is primarily responsible for guiding teams of creatives through large-scale animation and insert design projects. He believes in simultaneously investing in the employee and the project for a mutually beneficial result. O’Shaughnessy is interested in finding ways to reinvent the traditional permutations of sports television and discovering new ways to tell the stories that unfold. In his decade at ESPN, O’Shaughnessy has garnered 14 Emmy Nominations and several Promax BDA awards. Noteworthy projects include College Football on ESPN/ABC, NBA on ESPN/ABC, World Cup 2010 and 2014, Euro 2012 and 2016, Outside the Lines, Olbermann, and Mike & Mike 2016. Upcoming projects include redeveloping college basketball on ESPN. Before coming to ESPN, O’Shaughnessy worked at Ghostmilk Studios in Toronto, where he designed show title sequences for the CBC. Shaughnessy received a B.S. in psychology from Binghamton University and an M.F.A. in design from The Rochester Institute of Technology. He resides in West Simsbury, CT with his wife Shannon and their three sons. Brian Perkins is the senior director of IT production systems for MLB Network. He oversees graphics technology, production system integration, and the continual evolution of statistical systems used to enhance storytelling. In addition to MLB Network, Perkins oversees the IT Production Systems for NHL Network since its daily on-air operations became based and operated out of MLB Network’s headquarters in October of 2015. A seven-time Emmy Award winner, he places particular importance on automating creation of on-screen and on-set graphical elements containing baseball and hockey data. A lifelong baseball fan, he still owns all his baseball cards from childhood. Maria Rapetskaya is the creative leader and architect of Undefined Creative, a boutique motion graphics agency that works with household names like NHL, NBCUniversal, The Maury Show, “Better Homes and Gardens”, and the United Nations. She built the company’s reputation on good old-fashioned customer service and consistent execution on brand, on time, and on budget. She stubbornly remains hands-on in both design and production, doing what she truly loves on a daily basis. Blessed with nearly 20 years of success, Rapetskaya is a serious pay-it-forward give-backer through teaching, mentoring, writing and public speaking. She’s taught at NYU, NYU Continuing Education, and University of the Arts. Rapetskaya regularly contributes her thoughts on entrepreneurship and creativity to the likes of 99U, Fast Company, Entrepreneur, and Fortune, as well as professional organizations such as AIGA and PromaxBDA. Together with her studio, Rapetskaya donates 300+ hours a year in pro bono work and mentorships. Rapetskaya lives in Brooklyn, NY and has visited 60 countries on six continents. Bill Reinhart was awarded the 2015 Avid Chairman Circle for outstanding business development, capping 20+ years of achievement and leadership in the broadcast, post production, graphics, and asset management markets. In his current role, Reinhart defines and delivers innovative solutions to address strategic initiatives, leveraging partnerships and forging strong relationships with customers and alliance partners in core and expanding markets. For over two decades, Michael Rocha’s career has focused on interactive media and digital storytelling. Primarily working with large displays featured at sporting venues, he helped pioneer many of the ways fans enjoy events. This experience includes Olympic Games, Super Bowls, and several NFL teams. As director of creative and technical solutions with Panasonic Xperiences, he continues to develop new software platforms and workflows which continue to add levels of interactivity and capabilities, but with a 360 degree approach that moves beyond the venue. Some recent innovations include gesture control kiosks, social media integration, and new in-venue graphical data presentations. Rocha has 25 years of experience in digital media production. He spent 21 seasons directing and creating content with the Tampa Bay Buccaneers, as well as five seasons directing, engineering, and creating content with the Tampa Bay Lightning. Rocha has feature film credits of associate producer, second unit director of photography, editor, and visual effects. His short films credits include producer, writer, and director. Marc Rowley is a Dad of two children and husband to an incredible wife. He is currently the ESPN director of production enhancements, virtual and augmented reality. Rowley has led ESPN’s research and development in production enhancements over the past 10 years. He invented the ESPN Pylon Cam and ESPN GoCam, as well as the SportsCenter Rundown. He oversees a creative team at ESPN charged with advancing the graphical presentation of ESPN on television and streams. In his 18 years in Bristol, 22 overall with ESPN, he has made creating advanced storytelling his core mission. Rowley also volunteers his time with Save the Children. John Schleef is a seasoned art director for NBC Sports, NBCSN, and NBC Olympics, having led the creative for a majority of the best known NBC Sports properties. Schleef leverages his highly-charged creative energy, his passion for visually appealing design, and his drive for highly collaborative teamwork to deliver a compelling audience experience. As an eight-time Emmy award winner with 25 Emmy nominations, Schleef’s art direction and hands-on design/animation can be seen across the past seven Olympic Games, three Super Bowls (including XLIX in 2014, the most watched in history), and the #1 rated show on television, Sunday Night Football, since its inception in 2006. In addition, he leads the design teams for Football Night In America, Triple Crown Horse Racing (including the Kentucky Derby), the National Hockey League, Notre Dame Football, French Open Tennis, Premier League Soccer, as well as other sports properties. Schleef most recently led the network’s creative efforts on the Thursday Night Football show. Prior to his role at NBC Sports, Schleef worked at HotHaus Creative in Dallas, where he designed and animated a wide variety of projects for network and cable entities. Earlier roles include art director positions at the Texas Rangers Baseball and Dallas Stars Hockey Television Broadcast Group, as well as various network affiliates. Schleef received a BAA in broadcast and cinematic arts from Central Michigan University. He resides just outside of NYC with his wife Kimberly and their three children. Tom Shelburne has been with Vizrt for over 10 years and serves as the director of operations for the Northern Region. Shelburne has seen Vizrt evolve from the original provider of real-time graphics to now a global leader in sports analytics, MAM, PCR automation, and many other products built on the Viz Engine compositing platform. From WNEP in Pennsylvania, to NEP Supershooters, Shelburne is third generation in his family to make his career in television. However, he started off as just an entry level tape operator at a small station. Working his way up, Shelburne ultimately attained his goal as a full-time Los Angeles news, sports, and entertainment technical director. He earned six Sports Emmys for Outstanding Live Sports Series as a technical director. Leveraging his business degrees, he went on to new endeavors in television: managing, operations, and innovative broadcast projects which lead him to become an early customer of Vizrt graphics. Shelburne’s technical experience and depth of broadcast knowledge has given him a unique perspective, which is an asset in working with Vizrt customers to find optimal workflow solutions for their productions. Greg Stocker serves as the vice president of sports and live events at ChyronHego. With 22 years of experience in technology, his background spans across television broadcast production, audio engineering, audio consulting, and digital media content delivery. Stocker spent 14 years as the managing director of sports at Sound and Video Creations, best known for its Click Effects family of products for live A/V entertainment production. Following ChyronHego’s acquisition of Click Effects in July 2016, Stocker now leads ChyronHego’s new Sports Venue Division where he focuses on blending the unique interface expertise of Click Effects with the broadcast sophistication of ChyronHego. Michael Szykowny (better known as “Spike”) has been at ESPN for 20 years and is a six-time Emmy Award-winning senior director of motion graphics. He has worked on everything from Monday Night Football to the ESPN Megacast and he leads a group of over 150 designers, animators, and VZRT Artists that create and play out graphics for the family of ESPN networks. Szykowny recently added the oversight of the Production Enhancements team to his group, and he is both humbled and honored to be part of the SVG Graphics Forum. Jan Umansky has over 10 years of graphic production experience in the broadcasting industry, working at Orad Hi Tech Systems (acquired by Avid in 2015) and with multiple broadcasters all around the world. Over the course of his career, Umansky has led numerous strategic projects that involve on‐site installations, data integration, and graphics delivery. Some of his projects include the 2008 Olympics for CCTV China, 2012 elections for MSNBC, 2015 MTV Movie Awards, The Daily Show, 2016 Rio Olympic games, and many others. In 2012, due to lack of existing business solutions, Umansky developed two products and established Twizted Design to tackle known issues in the graphic production process. By establishing a strategic partnership with Avid, both products were successfully sold and are being used by brand name customers. New products are also being developed today. A husband and new father first, Eric Woods also manages a strong team of designers in his other role as design director of the promotional arm of NBC Sports. With a background in design, motion, compositing, producing, and managing, Woods was challenged to build a design team and workflow as NBC Sports transitioned from Philadelphia, PA to Stamford, CT. This team went on to design Promax, Cleo, and Emmy Award-winning campaigns for the many tentpole properties of NBC Sports. Through emerging technologies, Woods has been seeking new ways to convey stories in even more immersive forms. The advancements in VR/AR/MR of 2016 aligning with the Rio Olympics presented an opportunity for Woods to produce and direct NBCSports’ first VR/360 Marketing project: Tour of Rio. He continues to lead marketing efforts for these technologies to reach fans in captivating new ways.